If you want to attract bird to the garden, then bird baths are the best way to do so. Water will attract a wide variety of birds to the garden, and an ornamental bird bath can also enhance the beauty of your garden. The beauty of bird baths is that all birds are attracted, feeders and plants only attract a narrow range of birds. Water is essential for birds, they need it to drink, wash in and to keep cool. A little water simply makes a birds life a lot easier. 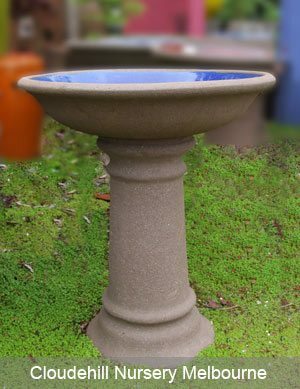 Bird baths are available for sale in a range on materials, such as sandstone, bronze, mosaic, terra cotta and concrete. Shallow sloping sides and a rough surface make for easy entry and exit. Remember to maintain your bird bath, regular cleaning will help keep the water quality high. This is best carried out by hosing out the bird bath every week or two, and giving it a good scrub with a brush every month. Bird baths are a popular addition to the garden, ornamental bird baths can be a great feature in any garden. Bird baths designed specifically to attract birds will provide water for birds during dry periods as well as attracting birds that perform many useful tasks in the garden, such as insect control. Solar Birdbaths that provide a fountain effect are becoming available in Australia. Can you make your own Birdbath. With a little skill it is fairly easy to make your own bird bath, take these features into consideration. Whatever you use needs to be able to hold water. You can make a small hanging birdbath, excellent for beneath trees. How simple can it be, simply find an old hub cap, or a metal garbage bin lid. If you have welding skills, weld it to a metal post. If you don not have the welding skills you can nail it to a wooden stand and silicon up any holes. Or of course you can investigate the many designs offered for sale from the suppliers listed below.